Behaviour Interactive is a series of independent Topics designed to be used by pupils working at the computer. Each Topic addresses one specific behavioural issue. 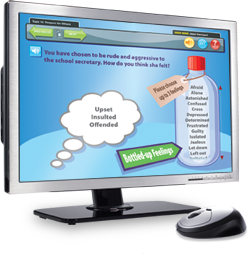 Topics contain short movie clips and a sequence of stimulating interactive questions all designed to make pupils THINK about their behaviour and choose to behave better.